Our annual Benefit Bowling Blast 2018 is all about having a great time while having a positive impact on the lives of Northwest Indiana's children from struggling families. The Buns Care is dedicated to our kids' education and welfare. ~~~At the link click for details you can become a business SPONSOR, or sign up TO BOWL. 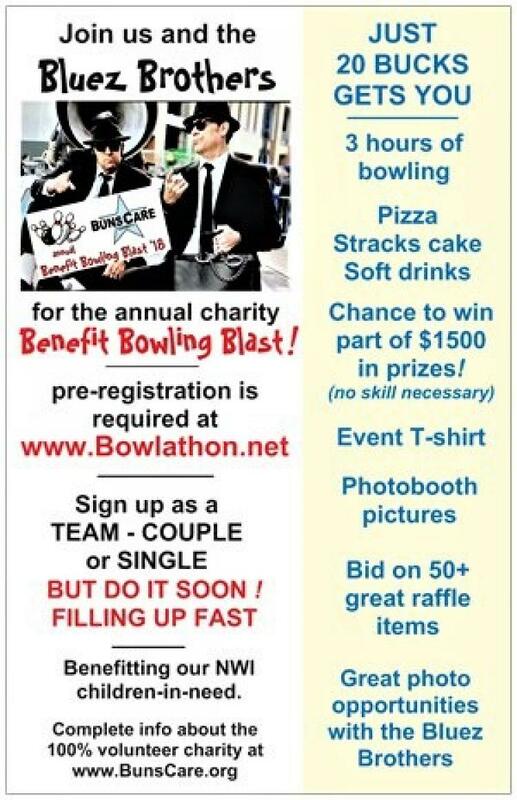 Sign up as a bowling team, an individual bowler or a couple. NON - BOWLERS ..... it doesn't matter! Its gonna be a BLAST and disadvantaged kids in Lake County will benefit! ~~~Great PRIZES! a total of 150 free Ultimate Car Washes will be given away, compliments of EASY CLEAN CAR WASH.... worth $1500! ~~~~Photo opportunities with Chicago's Bluez Brothers Act around the lanes and in our huge photobooth. You'll really enjoy their dancing and antics. ~~~There will be a 50/50 drawing and a Chinese Raffle with about 50 very nice items. If you have any raffle items you would like to donate, send us an email to event@BunsCare.org and we'll have a volunteer pick them up. A little information about the Buns Care Charity. ~~~We are a 501c3 nonprofit, verified by the IRS. FEIN 81-2779015. Over the last 2 years we have been able to provide over 600 pair of new shoes to Lakes County’s neediest children. We collected and distributed 179 pair in 2016 and an amazing 440 pair in 2017 with a total value of more than $12000. We do this by setting up business collection points throughout the county (21 last year) making it easy for everyone to drop off a pair or two. This year our goal is to wipe out our 440-pair record. The shoe drive runs for one week each year, beginning on #GivingTuesday, the Tuesday after Thanksgiving. Our most important (and the most fun!) fundraising event of the year is held each August on a Saturday evening at Stardust Bowl III in Dyer. Last year we hosted about 100 bowlers. In addition to bowling they were treated to great food, event t-shirt, awards, a Chinese Auction (with items donated by local businesses) and crazy photos taken in a huge photo booth. This year we are expecting close to 200 participants! The Charity was able to present scholarship to graduating high school seniors. Last year we were also able to help fund Andrean High School’s “Athletics, Fine Arts and Extracurricular Activities” program. These sort of things are being cut out of school budgets and we feel they are necessary for maintaining the overall mental and physical progress of our youth. The Charity was able to provide financial assistance to St Jude House in Crown Point for their new playground. The children that are sheltered there with their victimized mothers needed a new playground and the Charity feels very fortunate to be able to help. A new part of the Buns Care Charity is up and running! The Sisterhood Chapter is being led by Northwest Indiana’s cheerleader for children, Barbara Muckel. The focus of the Sisterhood is raising awareness to the importance of preschool education and helping families without the means to afford traditional preschool give their kids a chance to excel upon entering Kindergarten. The Sisterhood will be providing basic guidance and effective tools like a preschool learning kit full of hands-on exercises, requiring just 20 minutes of dedicated interaction per day between a parent and child. If you want to help or if you know of a family that could use this type of assistance, please feel free to contact Barbara via email at Sisterhood@BunsCare.org. The Sisterhood is raising funds thru a simple, unique recycling program for small electronics and inkjet cartridges.